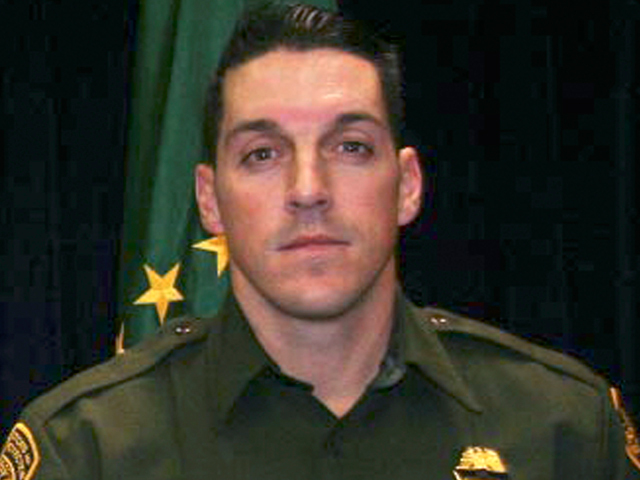 (CBS News) TUCSON, Ariz. - The Department of Justice announced charges against five individuals in the death of U.S. Border Patrol Agent Brian Terry. The 11-count indictment was unsealed Monday. One person already has been arrested and charged in Terry's death. While the indictment was handed up by the grand jury last November, covert efforts to locate and apprehend the fugitives have not resulted in arrests. Consequently, the Justice Department and Customs and Border Protection are jointly offering a reward of up to $1 million for information leading to arrests of those wanted. Terry was gunned down Dec. 14, 2010, in Arizona near the Mexico border, when he and other agents attempted to apprehend armed individuals in Peck Canyon, west of Rio Rico. The FBI alleges that the suspects had illegally entered the United States in order to steal contraband from drug traffickers. The five engaged in a firefight with border patrol agents, during which Terry was shot and killed. The suspects were armed with AK-47-type rifles. The rifles were part of ATF's then-secret operation known as Fast and Furious. The indictment charges Manuel Osorio-Arellanes, Jesus Rosario Favela-Astorga, Ivan Soto-Barraza, Heraclio Osorio-Arellanes and Lionel Portillo-Meza with crimes including first degree murder, second degree murder, conspiracy to interfere with commerce by robbery, attempted interference with commerce by robbery, use and carrying a firearm during a crime of violence, assault on a federal officer and possession of a firearm by a prohibited person. The indictment also alleges that the five assaulted the border patrol agents who were with Terry. Although Manuel Osorio-Arellanes was arrested on the night of the shooting, Favela-Astorga, Soto-Barraza, Portillo-Meza, and Heraclio Osorio-Arellanes remain at large, presumably in Mexico. Suspected ICE agent killer held in U.S.
A sixth defendant, Rito Osorio-Arellanes, is charged with conspiracy to interfere with commerce by robbery. "We will stop at nothing to bring those responsible for his murder to justice," said Attorney General Eric Holder. Anyone with information concerning the whereabouts of the fugitives should contact the FBI's Phoenix field office, at (623) 466-1999, a local FBI office, or the nearest American Embassy or Consulate.